Your Nativity, O Virgin Mother of God, was the herald of joy to the whole world; since from thine arose the Sun of Justice, Christ our God, who, destroying the curse, bestowed the blessing, and confounding death, rewarded us with life everlasting. The day our Queen of Heaven was born, ranks as one of the most beautiful moments in the history of the world, bringing with it the announcement which the long condemned mankind, had awaited… it was about to receive it’s liberation from the chains of sin. 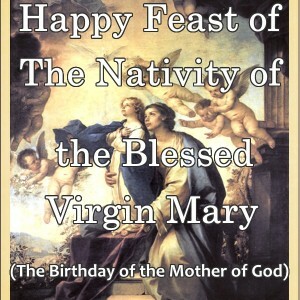 The Redemption of mankind was now at hand…Begun on this day, with the birth of Mary. Who from her very first moments of life, would illuminate the desolate earth with the grace of her sweet smiles. Her entire being radiated with continence and joy.